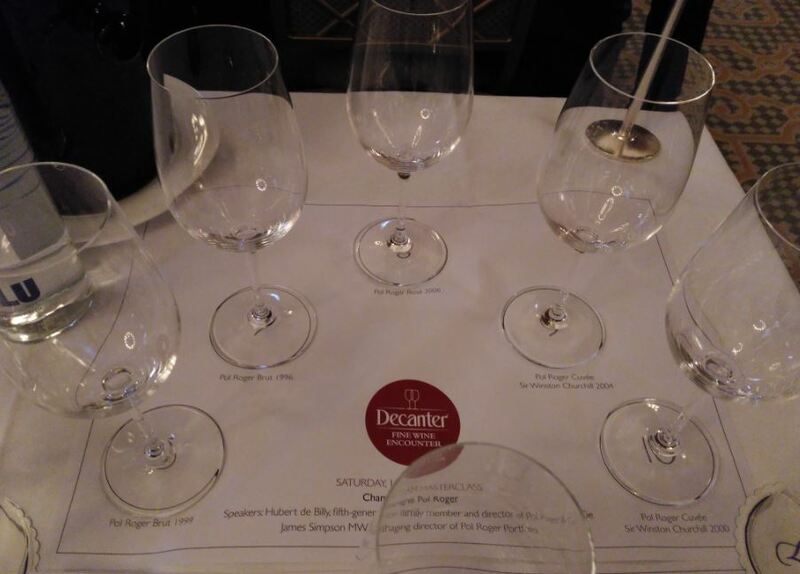 Presented here are the second half of my tasting notes from the recent Pol Roger masterclass in London, presented by 5th generation family member Hubert de Billy and managing director of the Pol Roger portfolio, John Simpson MW. A few notes on the wines: Pol Roger had been using concrete vats since 1930, introducing cask barrels in 1975. Stainless steel came in to play in 1985 and their entire operation moved to steel in 2012. Vintage Pol Roger is a blend of 30-40 villages. They have 92 hectares of their own, but have access to 33,200 hectares in total. They have stated that they will happily buy up any adjoining land to their vineyards that comes up for sale but, as the average cost of a hectare of land is 1.4 million euro’s, they are sometimes adding plots the size of an average UK back garden. This wine is the colour of dark hay but carries with it a lovely golden rim. The nose is dense with a good intensity and leaves a full and rich impression. This begins with dried yellow fruits, honey and light brioche, and moves in to darker tones of old wood and candied burnt sugar. The palate manages to retain vibrancy whilst showing the signs of good ageing. A mellow acid glides you through burnt toast, herbaceous notes and a clear biscuit character. These give way to dried apricot and pineapple, and a clear long finish extremely reminiscent of toffee. This is a well-structured wine which wasn’t hugely respected at the time (coming straight after the great 1998 and just prior to the millennial vintage), and is ready for drinking now (although will last for a further 20 years). For me, it was probably the highlight of this masterclass. Wonderful stuff. I may have been imagining it but there were almost hints of red in the dark gold colour of this wine. A distinct ‘high’ nose spoke of a wine just starting to oxidise and tire, it gave off touches of wet undergrowth, leather and coffee. The nose was also distinctly yeasty (it took me right back to visiting the Guinness factory in Dublin). The palate was still vibrant although also showing age with over-ripe and dried yellow fruit, a light tannin and slightly cloying candied sugar. Dark and brooding with coffee and nuts, a light cream and the persisting acid mean that it is an austere wine that can still give pleasure, but needs drinking up soon. This was the dark colour of wild salmon, but the nose was light, floral and expressive, with red cherry and smoky, savoury characters. The cherry leads the palate, followed up by strawberries and cream. There’s a clean medium acid running throughout which glides you through some smoky characters and just takes the edge off the underlying sweetness of the wine. Released this year, this grand cuvée is deep golden yellow in colour. The nose gives off fresh citrus lemons and ripe yellow melon before heading off in to sweet coffee and rich cream, toast and a popcorn-like buttery character. There was also some fleshy green apple and pips hidden amongst the darker notes. The palate is dense, nutty (certainly walnuts), ground coffee, savoury (some cheese), with sweet spice and mellow acid. A lovely long finish, and somehow ‘golden’ in taste. Even darker gold in colour than the 2004, this wine also has amber hints to it. The nose begins with stewed green fruit, and a slight oxidised character. The herbaceous, sweet woody notes tell you that this is a wine that has seen some good ageing. The palate is full and round, very dense and very creamy. Guided with a medium acidity, the lemon citrus and apple flesh lead on to dried pineapple, peach skin, milky coffee, and nuts. Despite these later darker tones the wine retains a vibrant and refreshing mousse and is a juxtaposition of light and dark. Wonderful for drinking now or keeping. These tasting notes round out my blog on what was an extremely pleasurable and memorable event. The first part of my tasting notes from this event can be found here. 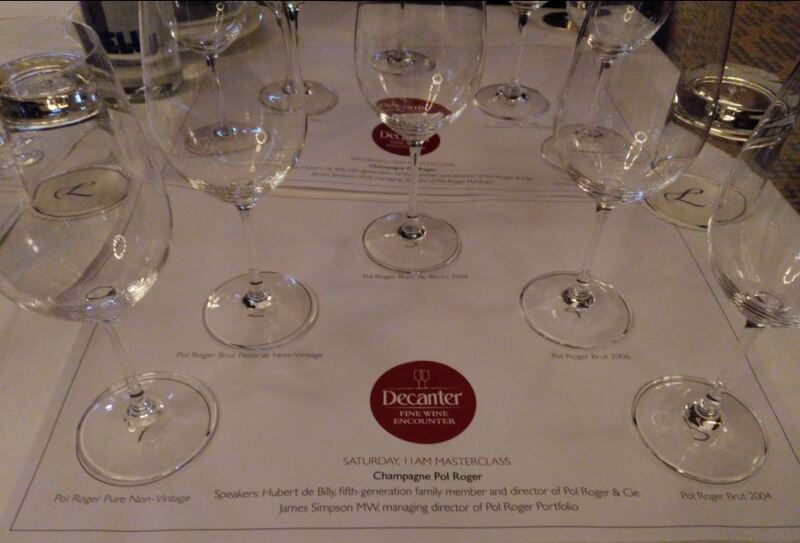 Presented here are the first half of my tasting notes from the recent Pol Roger masterclass in London, presented by 5th generation family member Hubert de Billy and managing director of the Pol Roger portfolio, John Simpson MW. The ‘Pure’ release has no dosage added to it, meaning that no final sugar mix is added and it is extremely dry in character. This non-vintage (and the Brut release below) is an even split of the 3 Champagne grape varieties (Pinot Noir, Chardonnay, Pinot Meunier), and hail from between 60-70 different villages. The colour is a clean youthful lemon, and the citrus carries on to the nose where it is joined by yellow tropical notes. The body of the wine is light and airy, crisp and linear with just a touch of cream. The palate is equally light and airy with the lemon notes coming to the fore. Without the sugar, this is indeed a pure wine that allows you to detect even the smallest of traits, and I can just detect subtle red fruit characters from the pinot noir that would usually get lost. The downside is that, without the sugar, the acidity is extremely noticeable. Whilst it has a good length it is fairly one-dimensional (and tasted extremely thin after tasting the Brut). Like the Pure before it, this wine has been aged for four and a half years instead of the required three years to ensure that, even at NV level there is some complexity. The blend here is therefore comprised mainly of reserve wines from the 2010 vintage, with both 2009 and 2008 also included to round it out. The Brut has additional colour to it, adding gold tones in to the lemon yellow. On the nose you can sense immediately that it is denser and richer (especially so for an NV Champagne), and you get the stalwart characters of honey, bread and cream. The palate is much rounder than the Pure, giving you a creamy full mouthfeel. Vanilla, toast and nuttiness are detectable as well as preserved lemon and cream. The acid is much more restrained and integrated here. Encouraging us to commit this wine to memory we were told that there are now no longer any bottles of the 2008 left for sale (these bottles had been especially partitioned for the tasting). Pol Roger make very little Blanc de Blancs and the grapes all come exclusively from Grand Cru vineyards. The nose was floral and rich with discernible vanilla nestling alongside the lemon and tropics. There was also hints of smokiness. The character of the wine is very light, but the body is weightier and adds peaches and apricot to the citrus cream. Delicate with lots more peach in the finish. This wine needs 10-15 years to reach its full potential. Released just a month ago, this vintage needs 10-12 years to mature fully. There are gold hints in the lemon colour. The nose is extremely distinctive, expressive and intense, with nuts, dried honey and dried yellow melon coming through clearly, followed by toasty notes. Conversely the palate is light and airy and, although still quite closed, you can detect the citrus developing in to broodier characters with touches of smoke. Whilst vibrant and quaffable, this will need time to open up fully to show its true character. Like the 2006, this wine shows gold in its lemon colouring and has a distinctive nose, this time moving towards dense wood and oak. Behind this you get preserved lemon and fruit, candy spice, violets, and floral spices. The palate is rich with cream and butter characters, and there are touches of nut and toast, but the sum total isn’t as dense as the nose would lead you to believe. The palate almost needs to catch up with what the nose offers, and needs 10-12 years to develop fully. The second part of my tasting notes from this event can be found here.